A few posts back, I featured a beginner's garment made with rectangles. It was truly a great way to venture into knitting without too much trauma. This design featured above is another idea based upon rectangles. In this case, they make a shrug. You can't get any easier than that. Once you have dimensions, you can use any weight or type of yarn for any season. A pattern I've suggested is for a traditional worsted weight. A good place to begin as this weight is the easiest and most times the most economical for beginners. 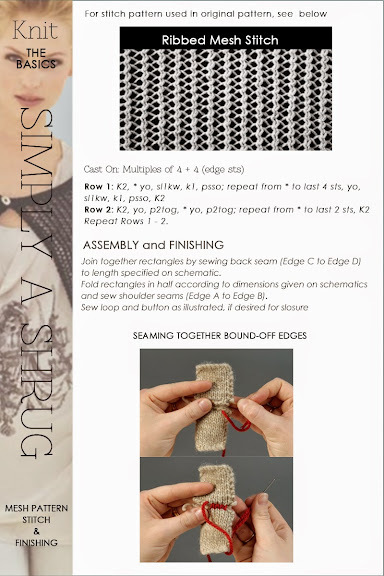 Read further for schematics, pattern instructions, finishing tips and helpful sites. The schematics or drawings of the garment's shape give you the dimensions you are to work to and the actual direction of the garment. The pattern itself is minimal as it is very simple. You are actually knitting two rectangles with a back seam and folded together where top edges are sewn together for shoulder seams. The sides are left open for armholes. A loop and button can be added for closure. By working to the dimensions indicated in the drawing, you will achieve the desired results, however if you are slightly off tension it will not make a huge difference.